No matter when you go, your Sapa Trekking Tours are sure to be the most beautiful and memorable. 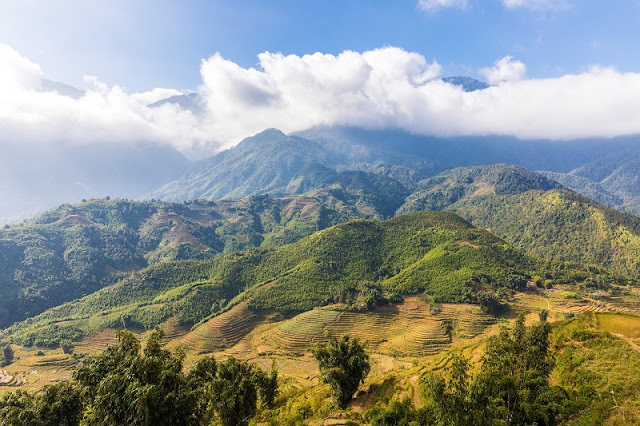 However, each season offers something a little different – so here’s a guide for what to expect through the year in Sapa to help you decide on the best time for you to go to have your own amazing trip. In the late spring and early summer, although the weather is quite warm, it is not as hot as other regions in Vietnam. If you spend time in this town in the period between April and May, you will have the chance to see the wonderful scenes of many colorful flowers and the wonderful beauty of terraced fields there.. If you visit in this April, you will be able to enjoy the beauty of Do Quyen flowers fluttering between forests of Sapa mountain, a charming beauty. During this period, it’s the time of growing terraced rice fields of the ethnic people. Whole of the valleys are covered with lime-green smooth color. Buffaloes pull ploughs across the terraces and the cone-hats of farmers dot the countryside as they squat to pull crops from the ground. From a far, it seems to look like a lively picture of nature. However, the terraced fields will be changed seasonally to gold color. That is also a reason of its beauty at any time. There come more sunny days and fresh air in April,creating the ideal ambiance for trekking and accessing remote hill tribes to get an insight into their dinstinctive traditions and lifestyles. Along with the spring, fall is a highly recommended time to visit Sapa. The level of rainfall reduces considerably, letting the weather become drier and milder. Moderate level of precipitation combines with stably cool temperature make falltime such a delight to admire the beauty of the golden rice fields in Sapa.. Nothing is as great as being taken under slight sunshine from slopes, along with the soft beauty of the yellow rice trees swinging in the wind. Enjoying light wind and fresh atmosphere. Also, the blooming of flowers is not only in spring, but also in summer. On this occasion, visitors would be admired romantic beauty of specific flowers which are spread out colorfully on valleys.